Like a lot of people in America, my family often turns to pizza for celebratory occasions. Growing up, it was often a reward for being a good sport after baseball games, getting good grades, birthdays, or even just celebrating the fact that it’s Friday. 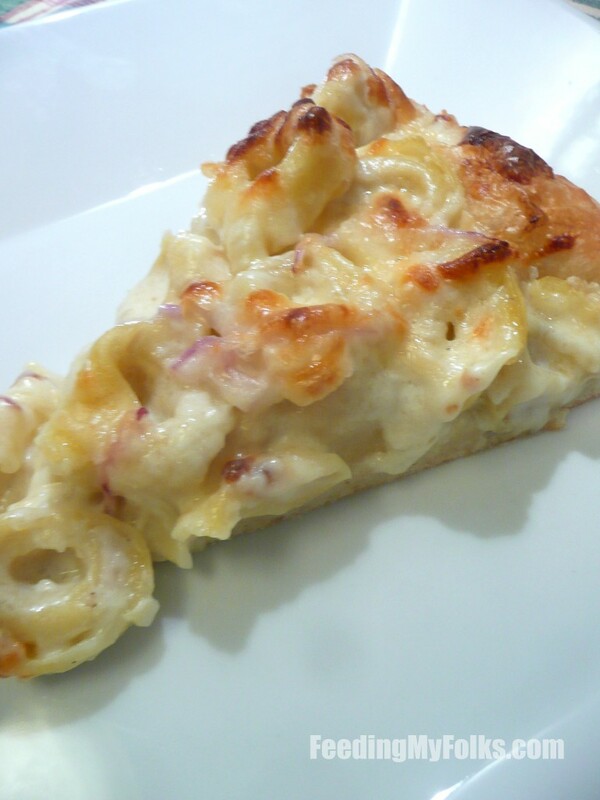 And even though we’ve enjoyed a lot of different toppings over the years, nothing said it was a special occasion more than tortellini Alfredo pizza. Kind of random, right? If my dad brought that topping home you knew it was probably a birthday. Well…it’s not anyone’s birthday for a couple months, but I decided to make it randomly at home to remind us of all the great times growing up. It starts with a light pizza dough and a slathering of homemade Alfredo sauce. 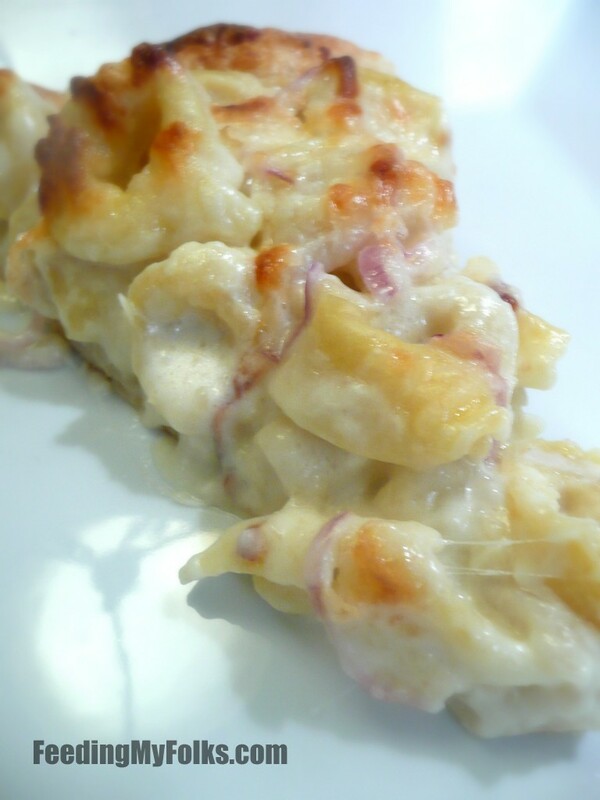 Then it’s topped with tortellini, thinly sliced red onion, and a drizzle of more cheesy Alfredo. To bind it all together, just give it a light coat of mozzarella and you’re good to go. You’ll totally be surprised how tasty it turns out…especially when it’s bubbling right out of the oven. I really want to stress how amazingly creamy, crusty, and delicious this pizza is….totally a carb and cheese lovers dream. Since I tend to like everything spicy, I usually sprinkle on some red pepper flakes for a little extra kick…but trust me, you don’t need to add anything. Like I said…it’s really freakin’ good! Bring a large pot of water to a boil. Salt the water. Add tortellini and cook until done. Drain thoroughly. Reserve. In a small sauce pan, melt the butter over medium heat. Whisk in heavy cream. Let it simmer for 5 minutes and then quickly whisk in the garlic and Parmesan cheese. Reserve. Roll out pizza dough and sprinkle with cornmeal. Flip (the cornmeal will be the bottom of the pizza). Spread 1/2 cup of the creamy Alfredo sauce on the dough. Top with tortellini and red onion. Pour 1/2 cup of the Alfredo sauce over the tortellini (there will be a little extra sauce, feel free to use all of it if you’d like). Sprinkle with mozzarella cheese. Bake on pizza stone for 15-18 minutes, or until golden. I just made this for dinner & it was easy and delicious. I made angel hair pasta, grilled chicken, and bacon crumbles and then topped it with this alfredo sauce. I will definitely be using this recipe again. Love the idea of using it on a pizza. Thanks for sharing this wonderful recipe! My husband went on and on about how good it was! Glad to hear it, Georgette. I love your idea to use crumbled bacon on the pasta…sounds delicious! ive had ziti pizza before, penne vodka pizza, and just plain vodka pizza (no pasta), but this looks AMAZING!!! 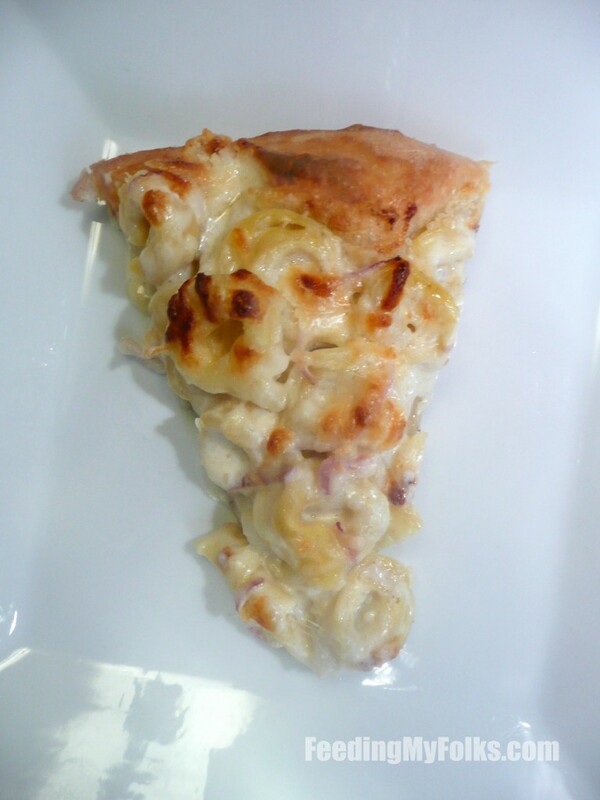 Tortellini Alfredo pizza is so freakin’ good. Penne vodka pizza is great too…for some reason, pasta and bread are a match made in Heaven!